Several phone calls and a day later I was hauling a large covered monstrosity from under my Grandmother’s spare bed. Ideally I would have loved to bring this to the University Studios to record in one of the live rooms, but it was soon clear that this wasn’t a option. The machine appeared to be made of solid cast iron and just getting it to the car was difficult. This was going to have to be recorded at home. Although my current recording equipment is good enough, I soon ran into problems with actually setting it up. My PC and I live in a rather cramped room where it is hard to block out the hum of the computer fan, so I made the landing my ‘live room’. This meant a lot of running back and forth between microphone and computer to check levels (there is nothing worse than spending several minutes thinking you are making a great recording only to find that it has clipped horribly, or isn’t there at all), but probably due to sheer luck most of the sound came out fine. I experimented with mic positions, finding that they made a massive difference, and in the end I had a lot of fun, though bashing away at an old-fashioned typewriter is surprisingly hard – hooray for modern keyboards! The biggest problem I had, (once I had solved the issues of noisy plumbing and inquisitive pets) came when I started to set up my microphone… and realised that I didn’t actually have a boom mic stand, just a normal upright stand. This had never been an issue before, but then I’d never really had to mic something closely on the floor before. I considered putting the typewriter on a chair, but I’d already dropped it on my foot once and didn’t wish to injure myself further. Makeshift measures were called for, as shown in this picture. 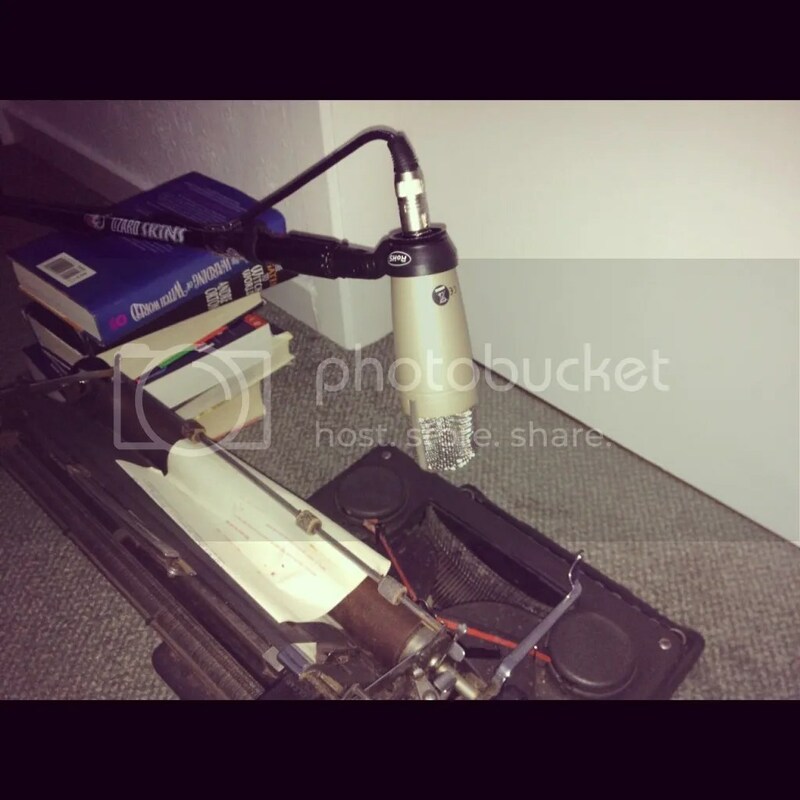 Makeshift boom – propping up the mic stand on a stack on books, then taping the cable so the microphone stayed in place. I think I’ve learned a lot from this experience, mostly that I need a new mic stand, but also that with the right preparation I can potentially do a lot with my home set up, (the room sound didn’t make half as much difference as I expected) and I will probably continue experimenting. If I have a day to myself, I’ll move my PC downstairs. I have the feeling my house’s entrance hall might be a great recording space! Lastly, a quick question for any audio experts out there. My Behringer Xynex 1202 mixer carries a warning that after switching off phantom power, the mixer should be left for a minute or so before unplugging the microphones. I’ve always dutifully followed this, but I’ve never heard it mentioned when working with bigger mixers. Is this a peculiarity of this mixer, or is it a good general rule to follow? My interface does have a fit of signal for a few seconds after +48 is switched off. A sense of Behringer covering their rears comes to mind with that warning. You’re probably right. I’ll keep doing it though, I don’t want to break anything.